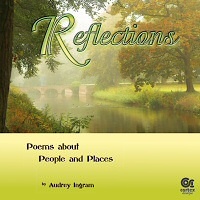 People and their circumstances, either real or imagined, feature in a number of these poems, with some ideas coming from unexpected sources. of horror, sacrifice and memories that, for some, will never go away. The collection ends with 'Peace', which echoes some of the thoughts and feelings expressed earlier in 'Summer Haze', 'Nocturne' and 'Country Churchyard'. 37pp, printed on 130gsm quality art paper. Available direct from the author. Please ask for a signed copy.